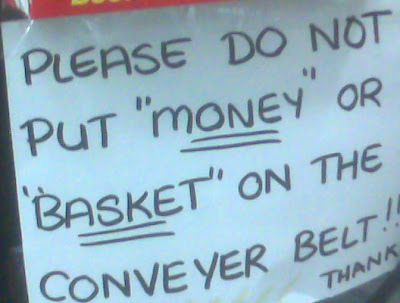 The “Blog” of “Unnecessary” Quotation Marks: "money"
Victoria in Queens, NY spotted this one. I guess they mean more general categories, so no boxes or food stamps on there either. And don't even think about a credit card. I think this was probably at a court house or something where they have a metal detector and a scanner for any bags. My local courthouse should make a sign like this actually, sans the unnecessary quotes. Last time I was there they yelled at me for placing the basket that I emptied my pockets into on the conveyor... apparently it can get stuck. I thought at the time, "There should be a sign about that." The frustration comes through loud and clear, with the use of both unnecessary quotation marks and underlining for emphasis. I imagine the cashier got tired of calling in the increasingly grouchy repair guy.